It is my pristine pleasure to host the Circus of the Spineless this month. Its like the Circus is coming home for the first time here at The Other 95%. 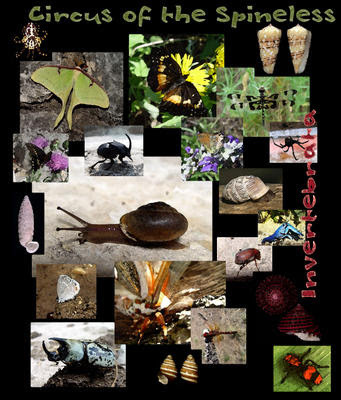 For those visiting here for the first time, I blog about invertebrates. I love 'em. They have enthralled me for years. They make up the majority animal life on this planet, 95% by conservative estimates. Though their diversity of form and function, as well as scientific and economic importance, is unabashedly high they often take a back seat to the mere 5% that make the backboned (especially the furry lactating kind). Being stomped on, burnt with magnifying glasses, flushed down toilets, flicked away, swatted at, sliced by boat propellers, trapped in nets and other violent acts, invertebrates have not had it easy in this discriminatory atmosphere. I've made it my mission in life to fight for the rights and increased exposure of the most amazing critters on this planet. My background is in ecology, systematics and invertebrate zoology, from Porifera to Urochordata. I have mostly closely worked with Cnidaria (Hydractinia symbiolongicarpus, various jellies, sea anemones and zoanthids), Cirripedia (aka barnacles: Neolepas zevinae, Eochionelasmus ohtai, Costatoverruca floridana), Crustacea (too many to list, but I do have a description of a new deep-sea shrimp in review right now), Mollusca (mostly Gastropods, especially limpets, and Bathymodiolin mussels), and Annelida (Siboglinidae, Alvinellidae, and MANY other deep-sea groups). I am studying the community ecology of hydrothermal vents and systematics of some invertebrates for my PhD research (4th year!). Without any delay I hope you enjoy my survey of October's collection of the Invertebrata! Tenia solium scolex (wikipedia commons). 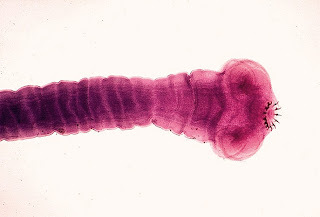 Can parasites be good for anything? Diane at Science Made Cool found some new research showing they make great bioindicators for metal pollution! Fresh out of OVUM (I couldn't resist), Aydin from Snail's Tales shares with us a superb dissection of the hermaphroditic genitalia of a snail from Turkey. Go check out one of my favorite deep sea snails, the "Gold-footed snail" at Deep Sea News! Don't click here unless you enjoy seeing poor little innocent snails being ripped to shreds in malicious acts of interphyla aggression! The Bird Ecology Study Group of Singapore presents a well illustrated article on birds and their molluscan prey. The Pet Monologues has a fascinating tale of a pet apple snail and its life. It has a sad end but it is a story is of compassion and a life lived to its fullest. "This story of Barney’s life could be the story of millions of other pet apple snail lives all rolled into one..."
Sisu wins the funniest title award with "Frankly, Scallop, I Don't Give a Clam" and discusses the nutritional significance of scallops complete with a recipe! 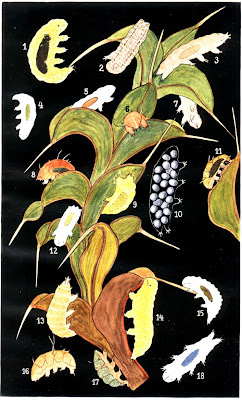 I will certainly be giving this a try and will give it a good blog review once I can find me some quality scallops in central PA.
Tardigrades on moss - a plate from the book "Tardigrada" by Ernst Marcus, 1929. Tardigrades in space from Deep Sea News. More astro-tardigrades here from Ed Yong at Not Exactly Rocket Science. 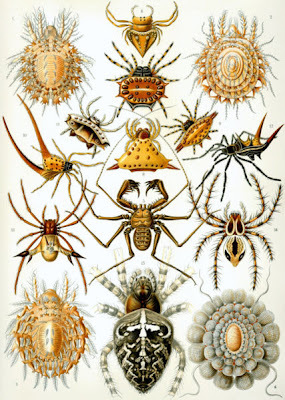 Plate 66 from Ernst Haeckel's Kunstformen der Natur (1904) (wikipedia commons, click for species IDs). You didn't know? It was Arachtober this past month! jciv has been posting fascinating photos on his Flickr site of an amazing arachnid every day in October. This one from Oct. 29 is uh-maze-ing! Use the sidebar to flip through dozens more spider photos. The Annotated Budak presents some seaside jumping spiders. Plate 86 from Ernst Haeckel's Kunstformen der Natur (1904) (wikipedia commons, click for species IDs). Snapping shrimp and a thunder crab from the Anotated Budak: "four thunder crabs were revealed, frothing with crabby rage." What the Shell is That?? (#2) Jason over at Cephalopodcast says its a stone crab, looking at the specimen it must be more like a pebble crab. Chris Taylor over at the Catalogue of Organisms presents us with a diverse array of Proctotrupomorphs, or parasitoid micro-wasps. There was a fascinating paper in Science published very recently on the molecular mechanisms of eusociality. Two fantastic bloggers wrote well thought out summaries and comments on this study. At Not Exactly Rocket Science, Ed Yong writes Paper wasps – caring mothers evolved into selfless workers while at Living the Scientific Life, GrrlScientist writes Why Do Wasps Do That? The Molecular Mechanism of Eusociality (sporting the new BPR3 icon!). Setting the bar for some of the best macro photos for bees and wasps this edition of the CotS, Bootstrap analysis shares with us the diversity of Hymenoptera from her yard. It just goes to show what amazing things you can find if only you look (and have a good lens). One of my own contributions to this edition is on the evolution and costs of light production in fireflies. Wrenaissance Reflections shares a wonderful shot of a grasshopper from her yard. Ben Cruachan presents his favorite insect - the hover fly! Oh you think its a little worthless fly? His beautiful macro photos will certainly change your mind. Oh what a pretty monarch butterfly! Oh wait, that's not a monarch, or is it? Head over to Andrea's Buzzing About to find out for yourself with Movers and Fakers. To Spray or not to spray? That is the question and Jennifer from the Invasive Species webblog wants to know your answer! So head over there to learn about California's invasive apple moth and voice your opinion. At 10,000 Birds (and counting too!) Corey writes about Buck Moths complete with awesome photos. Mike also writes about the Wooly Bear Caterpillar and how its appearance tracks the harshness of winter. The giant spitting earthworm needs your help! 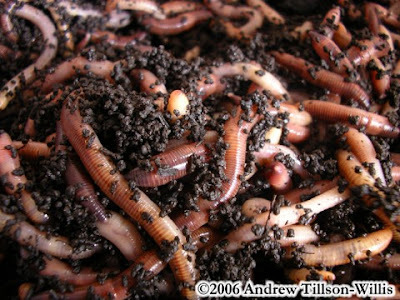 From the prairies of the northwestern US, this rare meter long earthworm is in serious danger. I'm contributing this piece highlighting a most unusual creature that you might have never known even existed! Neurobiotaxis presents research findings on how vertebrate brain patterning genes are similar to those of perhaps-not-so-lowly flatworm and fruit fly. Ouroboros discusses senescence and physiological changes with aging in bees and ants. The Annotated Budak shares some wonderful photo essays with us from his journeys. Fancy a moth and more from the Cameron Highlands? Is four phyla enough for you, check out the sandy shores of the South China Sea? Last month saw the Great Insect Fair here at Penn State and Via Negativa (another central PA blogger!) presents all those tasty insects that made up some of the southwestern-themed meals there. This is an amazing fair held every year. This was the second year we were able to make it. My son had a ball at the Insect Zoo, which my friend and neighbor was in charge of. 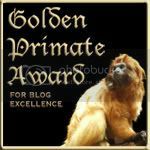 Arthropods on a birding blog!? Fantastic I say! Especially the photo of all the tiny little milkweed bugs. A DC Birding Blog presents us with Arthropods from a Grassland. That's all for this edition of the Circus of the Spineless. Thanks to all the submitters for their superb submissions! Keep up to date with the best traveling Circus in the blogosphere by bookmarking the CotS aggregation site and volunteer to be a host for March and beyond. Next month, The Hawk Owl's Nest will give us edition #27. You can submit posts to "pbelardo(-at-)yahoo". Wow, this is huge! Will take a couple of days to read all. Lovely! Great job, Kevin. I'm really looking foward to following all these links! 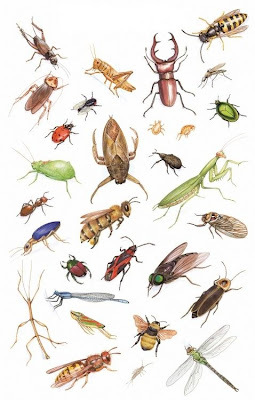 I also want to mention that an online literary magazine I help edit, qarrtsiluni, just kicked off a two-month feature on insects, and we're soliciting for contributions from scientists and naturalists as well as from literati: Call for Submissions. A totally awesome job, sir. Great graphics, lively, informative text and just plain fun. Thank you so much, and best of luck with your PhD research. A polished production, great stuff. Yokara, which images are you talking about? 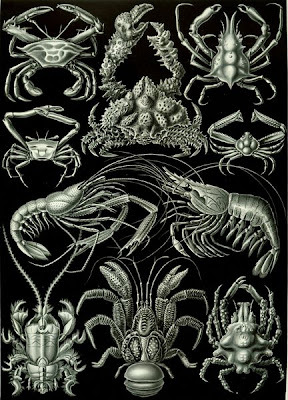 The drawing of Haeckel are based on real organisms though he always took much artistic license and used sharper angles than found in real life. Dave, the literary zine looks great, I'll do a post on it in the near future and see if that helps you get submissions. Sissy, I'm glad you've warmed up to the spineless! They make great friends once you get to know them. Thanks for your kind words. One little thing: for the first "Tardigrades in space" link, you need to take a blank off the end of the URL or you'll get "File not found". thanks monado, i fixed the link! Get Your Circus of the Spineless Submissions In!! Grand Opening of the Beagle Project Shop! Happy Hallowmeme From The Other 95%! Go On a Dig at Boneyard #7! The Giant Spitting Earthworm Needs Your Help! Happy International Cephalopod Awareness Day!